Not many women can say Clint Eastwood has been in their kitchen. But then, most kitchens don’t look like Terry Paulding’s. Well-stocked and spacious, Paulding’s Emeryville kitchen is featured in Eastwood’s new supernatural thriller “Hereafter.” It’s the site where Matt Damon and Bryce Dallas Howard first meet in cooking class. With her Oakland-based daughter, Tracy, at her side, Paulding runs a busy schedule of hands-on cooking events, as well as a popular catering business. It all started with Piedmont Adult School, were she taught food preparation for 22 years. 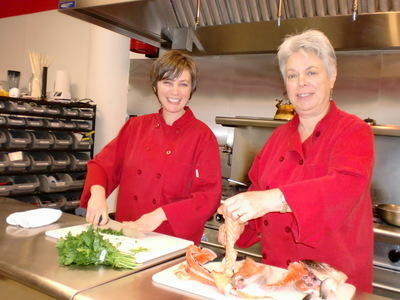 But it wasn’t until a student asked her to cater a wedding, that she thought about launching Paulding & Company Kitchen. Today her clients include students, corporate bigwigs and Hollywood stars. It started when the producers of “Top Chef” chose Paulding’s site for their opening season in 2005. “That was a blessing, as far as I was concerned,” she says, adding it came at a time when she’d just built her new company kitchen. The crew filmed there for three weeks, giving Paulding a boost in both cash and cache. At the same time, her team building classes were taking off, offering a tasty new twist on the kind of team bonding that used to be done on rope courses. Paulding’s location in Emeryville meant access to cutting edge companies like Pixar who were open to new ways of sparking creativity in the workplace. Not long ago, the animators of the hit film “Ratatouille’ had a team building event at Paulding & Company Kitchen. They chopped together, cooked together and came together in a way that only food can facilitate. Even families thrust together by marriage use food as a bonding agent. Call it eat, pray and love for the in-laws. Wedding parties use the days before their special event to cook together, then eat the fruits of their labor. It’s a good way to get to know the family with whom you’ll be spending future Thanksgivings, as long as no blood is spilled. “We penalize a team one minute if they cut themselves,” says Terry Paulding, who runs food prep relay races as part of group bonding. Cooks divide into teams and chop onions, garlic, herbs, all the foods you prep in the kitchen, only with the clock running. It’s this kind of fun that has tongues wagging and the buzz is reaching all the way to Hollywood. When the cast of “Hereafter” came to Paulding’s kitchen to shoot, it was three days of creative combustion she’ll never forget. In a delicious twist of fate three special people have been drawn together by a chef’s best marketing tool — word of mouth.